We occasionally receive excellent questions and/or comments by email or via our contact form and have then usually corresponded with the emailer directly. But, some of the questions and answers deserve a broader audience, so we decided to highlight some of them in a new series of blog posts. For the average citizen, who perhaps has a rudimentary grasp of general science, one problem with the topic of climate science is that it is such a huge subject which draws on a wealth of knowledge from many different science disciplines. It is easy to get lost in the weeds of this detailed knowledge which informs our conclusion that the current changing climate is due to human emissions of greenhouse gases. The broad strokes of climate science may be grasped with a limited amount of scientific knowledge: carbon dioxide and other greenhouse gases absorb and release heat (infrared radiation)...burning fossil fuels releases CO2 into the atmosphere and this increasing amount can be measured...more CO2 in the atmosphere will mean more heat energy in the climate system causing climate to change. But that basic knowledge is grounded on many more complicated lines of evidence: the weeds, which can often be very confusing to the science novice. Recently, our inbox has seen a fair number of emails from folks asking about carbon isotopes. Some emailers asked basic questions while others asked about some finer details of the more complicated science. This post will offer a primer on some of the basics about what isotopes are, where they come from, and what isotopes can tell us about Earth's climate. In a second post we will get into the weeds a bit and explain how carbon isotopes are measured. All atoms are made up of protons (positive charge), neutrons (no charge) and electrons (negative charge). The number of protons in an atom's nucleus defines what element that atom is. For the element carbon, all atoms have 6 protons and 6 electrons (Figure 1). Most carbon atoms also have 6 neutrons, hence 6 protons + 6 neutrons = carbon-12 or 12C. 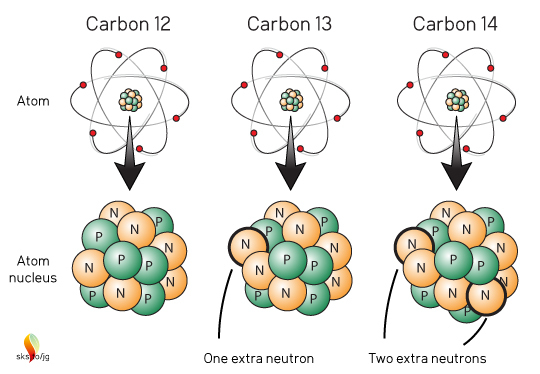 But a small number of carbon atoms have an extra neutron, carbon-13, or 13C and an even smaller number of carbon atoms have two extra neutrons: carbon-14, or 14C. Figure 1. Structure of the three naturally occurring carbon isotopes. These three, naturally occurring "flavors" of carbon atoms are called Isotopes ("same type"). Chemically, they all act like carbon atoms, they all "look" like carbon atoms. The 13C and 14C atoms are just slightly heavier than 12C. The vast majority of carbon on Earth is 12C with about 99%. 13C is about 1%, and 14C much, much, much less than 1% (about 1 atom of 14C per 1 trillion carbon atoms). Think of those ratios as the baseline or background ratios of most naturally occurring carbon on Earth. Take a random rock, or block of wood, or pound of flesh and measure the carbon in it and the ratios will be very close to 99%:1%:<<<1%. Well almost, but we'll get to that later. 12C and 13C are "stable" isotopes which do not change, but 14C is "radioactive" (often called "radiocarbon") and decays over time into nitrogen. The "half-life" for 14C is 5730 years, which means that if there are 100 atoms of 14C in some sample, 50 of them will decay to nitrogen in 5730 years. In another 5730 years, 25 of those remaining 50 14C atoms will decay, etc. Eventually, virtually all of the 14C atoms in the sample will decay to nitrogen. And nitrogen in Earth's atmosphere is where 14C atoms originate. 14C is formed in the atmosphere by cosmic rays (Figure 2). These "rays" are actually high-energy particles rather than light rays (electromagnetic radiation), although they move at nearly the speed of light. Most cosmic rays are the atomic nuclei of hydrogen (a proton) or helium (two protons and two neutrons, also called an alpha particle) which have been stripped of their electrons. They come zipping into the atmosphere from outer space and undergo various transformations which generate neutrons. These neutrons then collide with nitrogen nuclei (the most abundant element in the atmosphere) converting them to 14C and an extra proton which the new 14C spits out. Figure 2. 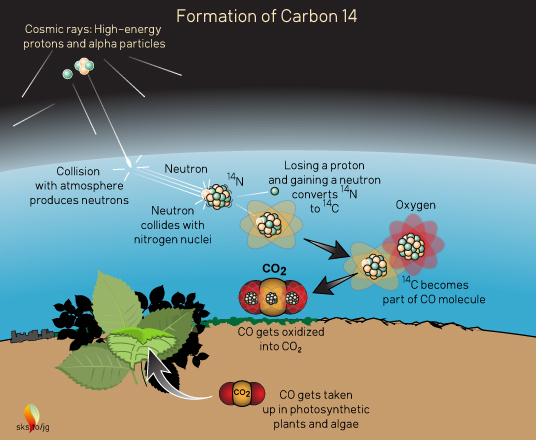 Formation of carbon-14 in the Earth's atmosphere. These high-energy reactions leave the individual 14C atoms with a lot of kinetic energy, causing them to crash into many other atoms/molecules in the air. They zip about grabbing electrons (which get stripped off in nuclear reactions) and eventually join with oxygen to form CO which can then be oxidized into CO2. Since all carbon isotopes are the same chemically they can all interact with other atoms and molecules in the same way. In photosynthesis, living plants take in CO2 from the air, energy from the sun, and water from the ground to make the building blocks of living matter and the energy they need to grow. All three carbon isotopes show up in the CO2 which plants use in photosynthesis, however, since 13C and 14C are slightly heavier than 12C, the plants "prefer" to use the lighter isotopes of carbon: 12C over 13C over 14C. So if you took a plant and measured what isotopes it has you would find that it would be slightly "richer" in 12C than in the naturally occurring background ratios. So it might have 99.2% 12C, 0.8% 13C, and much, much less than 1% 14C. And since animals eat plants (and other animals which eat plants) their isotopic ratios would be similar to plants. Now, imagine what happens to plants which die and get buried in the muck of a swamp somewhere. They don't really decay and no critters eat them, they just get buried deeper and deeper by muck and other plant material. Eventually, given enough time, virtually all of the 14C will convert to nitrogen. If we dig them up some millions of years later and measure their isotopes they will just have 12C and 13C. This is exactly how we get fossil fuels: tons and tons of plant material get buried and compressed over vast stretches of geologic time. By the time we dig them up any 14C that was there has long since decayed. So when we burn these fuels the carbon we are adding to the atmosphere is enriched in 12C and 13C, but depleted of 14C. And, since the fossil fuels come from plant material, the carbon is also richer in 12C versus 13C. So now when we measure the atmosphere's CO2 we can see that over the last hundred years or so the natural background ratios of 12C:13C:14C are getting more and more skewed to more 12C, and less 13C and 14C. This is one of the many lines-of-evidence which show that the rise in CO2 in the atmosphere is caused by the burning of fossil fuels. 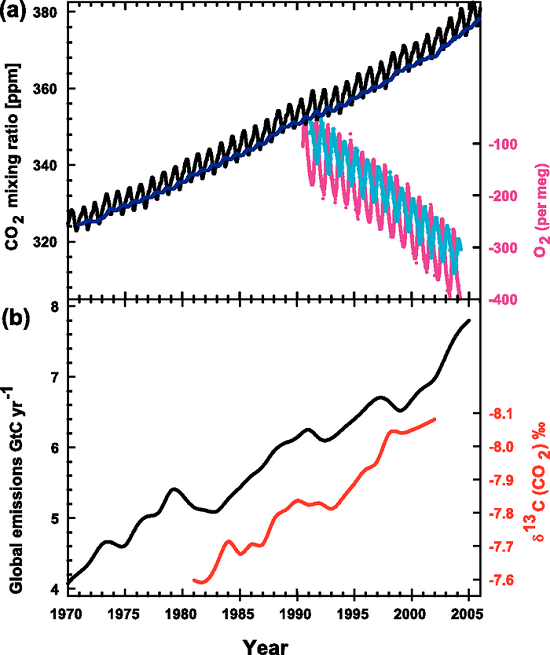 The top panel (a) of the graph shows the familiar rise in atmospheric CO2, measured in parts per million (ppm): the black, saw-toothed line. The carbon isotopes are measured quite differently, in δ13C (CO2)‰. In Part 2, I will explain what this strange incantation means. Thanks to Sarah, Dikran, and jg for help with this post. I categorically object to the use of term "weeds" to describe complex knowledge that must be simplified in order to explain the basics. As much as I like the explanation of CS to on this site in general, the use of the term "weeds" in this article is so logically incorect and even misleading that it warrants my objection. I'm a bush regenerator in my spare time here in Australia, so I'm entitled to speak on this subject. The term "weed" means a plant that grows somewhere out of its natural place, and often disturbes the balance of the ecosystem by suppressing other native species, so we don't want it to grow there. Following that definition, by calling the detailed, complex knowledge of CS by the relevant experts "weeds", do you imply that their knowledge is misplaced, that said knowledge interferes with other information and that we want to remove it? Nonsense, misleading characterisation at worse, or a serious mistake at least. I'm surprised that you made such a mistake. Perhaps you meant the climate myths by science deniers or contrarians, should be called "weeds". Those myths, that needs to be eradicated and the reculting gaps replaced by positive knowledge, so the "weeds" analogy would be precise here. But you're not talking about science deniao here. I think you should re3tract that "weeds" term from this article and replace it with something more apporpriate (e.g. "deep ocean where you drown") otherwise you will atract harsh criticism and disapointment from people like myslef who know what "weeds"really are. "Dear Word Detective: The phrase “getting into the weeds” is widely used to mean “getting into the details,” often with the inference of getting into too much detail. I have a guess about the origin of this phrase which is that it comes from harvesting." It is clear that is the meaning here. David Kirtley wants to get into a lot of detail about carbon. michael sweet explains it well. Think of a field of beans or some other crop: the view of the entire field is similar to the broad explanation of climate science. But when you get in closer among the furrows of the field and zero in among the weeds you are getting into the finer details of some aspect of the science. Thanks David. I've used this information in my cllimate presentations as part of the answer to the question "how do we know it's us?" My answer is Math, Chemistry and Physics.... This is the Chemistry part. I have to agree with Chriskoz. I found the lost in the weeds termnology rather off putting terminology. The statement "For the average citizen, who perhaps has a rudimentary grasp of general science" was a bit patronising. Only has a general grasp of science is better. But its a nit pick. Overall this article has stunning precision and clarity. It's the best written article on a complex subject I have read in years, and I read a lot. Frankly it sets the standard. Perhaps Lost in the Weeds is an American colloquialism. I do not use it but I knew what it means right away. I found a reference to American slang. Does anyone from England know this phrase? I think Nigelj and Chriskoz are from down under. I'm also from Down Under, but I too knew immediately what was meant by "lost in the weeds". I've done my share of complicated physics (many many years ago) and I don't feel insulted. I appreciate the "thanks" and praise! "The statement "For the average citizen, who perhaps has a rudimentary grasp of general science" was a bit patronising." Yeah, I should have worded that differently, I certainly don't mean to be patronising. Everyone has gaps in their education, by no fault of their own, myself included. But the truth is everyone (even with an exceptional education) has some limited knowledge in some field of study. There's nothing wrong with that, that's just the way things are. There's no judgement in that, merely a statement of fact. Skeptical Science strives to make all of climate science accessible to the widest audience possible. It is important for us to keep in mind that not everyone in that audience has the same interests in science, the same background knowledge of science, or understands the science-ese that scientists use. I always read scientific articles literaly. And that includes SkS. This incident of a colloquialism being misunderstood underscores the need of using precise language when talking to a large, especially international audience as is the case here. I work for a company doing scietific research for a large Japanese company. For obvious reasons, any idioms/jokes/colloquial terms (Australian, American, British or otherwise) are forbidden in communication with our cutomer. Simple grammar and usage of words in their basic meaning only are strongly encouraged. Even with such cautionary principles, the meaning of your discourse can be lost in translation. Of course these rules are relaxed when we socialise with a sip ok sake, and we can tell jokes by then. Our Japanese collegues usually don't understand our jokes but are happy to learn them as is appropriate during partytime. Thanks for teaching me a new idiom involving the word "weed". Like many idioms, it just does not make sense at face value. Although I acknowledge its existence, I will never use it, because it's simply silly to me, as it would probably be in any formal context to every bush or forrest regenerator. But let's move on, because the mistake of using a silly idiom in this article can be disregarded: it does not affect the informational value of the article. And said value is excellent: clear at the intended level of understanding and accurate to the best of my knowledge, nothing to add. Lots of people will benefit from that information, so thanks David for writing it. Am I missing something? The red scale on the lower plot is not reversed. The comments by chrizkoz ring a familar bell. I used to work for a multinational european company. I was asked to present a talk to one of the continental partners. In order to distinguish the subtle difference between tally and count an illustrated joke suggested by my supervisor was used. This was followed later on by another joke and a red herring both to illustrate points. I passing the slides to my supervisor he then deleted the second joke stating that one was enough any further attempt at humour would not go down well. OK so it was deleted. It then came to the continental manager to check out the talk who was emphatic that the red herring be omitted as it could mislead. My reply was that it was to illustrate a point, he agreed but it had to go out since I had used up my limit of hunour stating that he understood us and was not offeneded and my bahaviour was perfectly acceptable in my country but not in his. Maybe JohnBoy@10 would better grasp the meaning of the graph 3b if he had got the δ13C unit used in the graph explained. Perhaps I'm jumping ahead here because you promissed to explain the δ13C measurement process in the next part, but JohnBoy's question warrants such jump. As a typical isotopic measure, δ13C is a measure or enrichment of 13C in a C sample, compared to the standard sample. A standard 13C/12C, as you mentioned above, is about 1%, or more precisely 0.0112372 as explained by Wiki. Looking in that wiki link, the isotopic enrichment of 13C is defined as (13C/12C - STD) / STD, where STD is the standard value of ~1% above. From that simple formula, you can see that standard's δ13C value is 0 (not enriched nor depleted) as expected. The value on the graph 3b changes (in per mil) from -7.6 (in 1980s) to -8.1 (in 200s). Which means δ13C in atmospheric CO2 is always depleted (negative) compared to hte standard. But it is becoming more depleted, in accordance with the teachings of the article. So there is no error in the red scale of the graph, it is intuitively correct. “Lost in the weeds” is a great saying because it perfectly explain the irrationality of groups. Education is one thing,.. but individuals undertake such concepts- not random groups of voting consumers! Everyone's obviously ignored the irrelevant, alternative reality troll bozzza@14 above. I suggest mods to enforce comments policy and delete the troll (and this message) in their passing. Thanks. ChrisK: are you sure you know what a troll is? How many times have you caught me promoting fossil fuels buddy?? You don't own the internet.. or are you such a huge troll that you actually do? Indeed, @15, I should have said that bozzza@14 post is "of topic" and not "troll". I appologize for using the wrong term and the implied offensive language.